Happy Friday everyone! I hope everyone had a lovely week. E and M will be visiting next weekend. I’m super excited, as I’ll get to see my two cute little nieces. Which means this weekend, I’ll have to start cleaning. Yuck! It’ll be the first time they’ll be seeing our new place since Chris and I bought it last fall. I gave a quick tour via FaceTime but that doesn’t really count. I’m dreading having to scrub and clean, but at least I’ll have these yummy blondie bites to look forward to after my cleaning. These blondie bites are super easy to make. When they first came out of the oven, I sampled one. I couldn’t get enough of it. I had to refrain myself from eating more. Plus they’re bite sizes so you’re not gorging yourself with a big piece. And trust me, you’ll want to make these. They’re so good, it’s like eating chocolate chip cookies. Be sure to have a glass of milk to wash everything down. Enjoy your weekend! Using a stand or electric mixer (or mix by hand) mix together butter and sugar until combined. Beat in egg and vanilla extract. Then add flour, baking powder and salt. Continue to beat until combined, scraping down the sides of the bowl. Then fold in semi-sweet and white chocolate chips. Using a 1-1/2 tablespoon cookie scoop, spoon batter into each baking cup (about 1/3 full). Bake for 12-14 minutes or until the tester/toothpick inserted into the center comes out clean. Cool slightly in the pan before transferring them to the cooling rack. I love these – they look delicious – and so cute. I “pinned” these immediately. Have a great time with your nieces!! I’m having some family come to visit from Quebec, Canada next week – so now it’s MY turn to have to clean and scrub…. 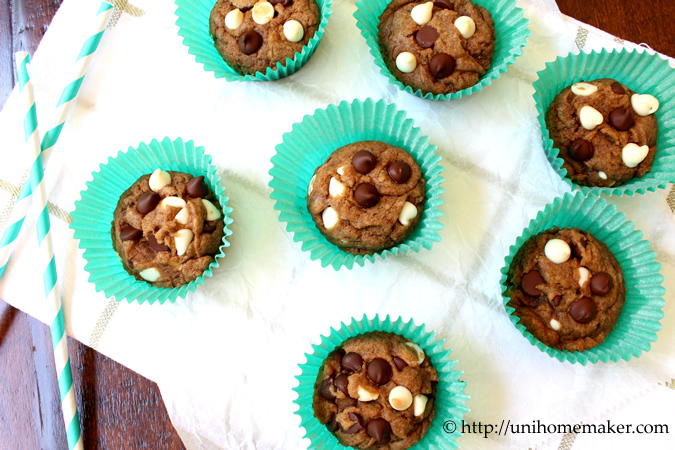 These are so cute, and they look so yummy, too, Anne! I love these blondies bites. They look so luscious and delicious. These look melt-in-your-mouth moist! Mmmm…you sure know how to tempt a girl! Have a great weekend!! They look so cute & tasty. These looked like plumped up chocolate chip cookies. But they had the texture of a brownie. And they tasted…fantastic! I felt exactly the same way. Love these bites. I feel a bit more guilty when they are bars. 🙂 Thanks for stopping by Pamela! These look so delicious, Anne! I love cookie bites. Thank you so much Marcie! These are so cute! I could down a dozen easily! LOL, me too! Thanks for stopping by Georgia! Heck, I’ll come over and clean for some blondie bites! Those look delicious! Mmh, these cookies look so yummy, could I sample one too ?? The look so cute wrapped in the green paper, really irresistible. LOL, I’ll beam some over. 😉 Thanks for stopping by Daniela! Anne can’t wait to try these. I love blondies in all forms, but these individually-sized ones are so much more fun! There’s no way I’d be able to stop at just one of these! They sound majorly addictive. They are! Thanks for taking the time to comment Joanne! Awww.. thank you Kiran! So sweet of you. 🙂 Have a great week! Now you’ve gone and made me drool all over my keyboard! Great recipe Anne. For a plate of those I would have helped you clean! This is the year of the blondie, right? You’re doing it proud. I love bite sized treats! No cutting and crumbling to worry about! These blondies look deliciously full of chips. My favorite part of blondies/brownie is the chewiness. So these have the best of all worlds. 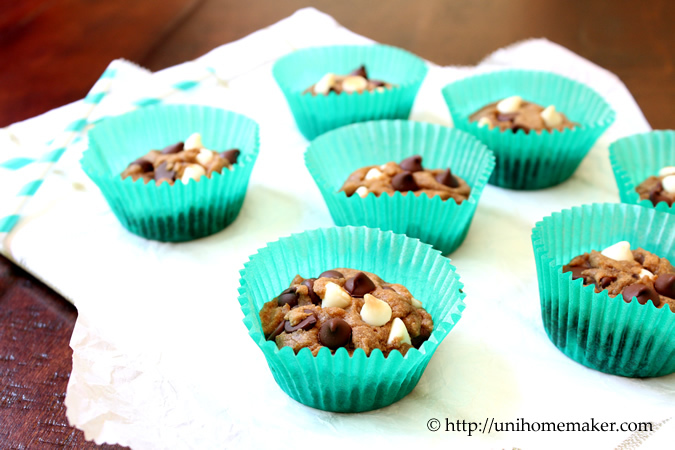 Flavor of chocolate chip cookies and texture of blondie/brownies! Enjoy your nieces’ visit! 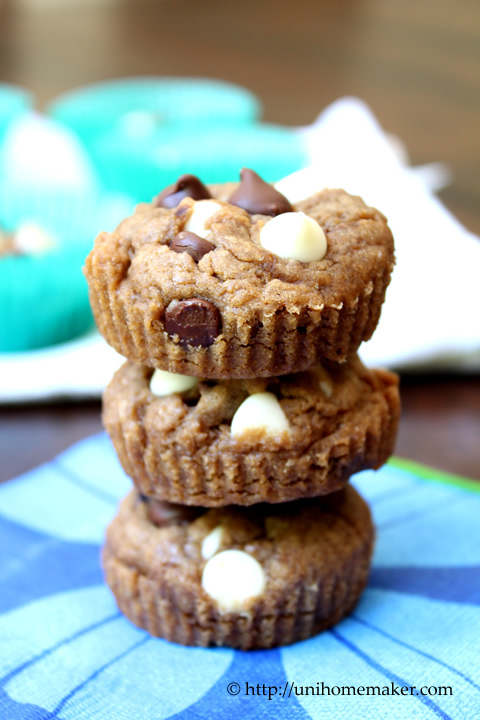 These double chocolate chip blondie bites are so adorable. I could probably eat way too many in one sitting! hahaha….have a wonderful gathering. 🙂 I’m sure you’ll all have a great time together. Was there any left for your nieces? Oops, we probably should have saved some. Anne will likely blame it on Uncle Chris! These look so cute and delicious! They would work great as small bites at a party or gathering (too dangerous for just myself–I’d end up eating too many in one sitting)! Cleaning is the pits, isn’t it? But you gotta do it at some point, so might as well make the best of it. And having these delish looking treats to look forward to is a wonderful incentive! Good stuff – thanks. Cleaning IS the pits! I spent Saturday from 12-5 cleaning. So glad that’s over with. Thanks for your lovely comment John. Such delectable little blondie bites! I could never eat just one! Hope you got all your cleaning done! Have a good week! Thanks Reeni –I have! 🙂 Have a great rest of the week. Yay! New blog layout unveiled! I officially unveiled mine today too! I am so going to make these bites. I must go buy white chocolate chips soon. These blondie bites are awesome! These are so cute! They look so delicious! Yum! Love these little bites!! Cleaning before family comes = one of my least favorite chores hahaha I hate cleaning! But I do love visits from family : ) Hope you had a great time this weekend! These blondie bites are adorable! I could easily eat the entire batch of these. They look divine! 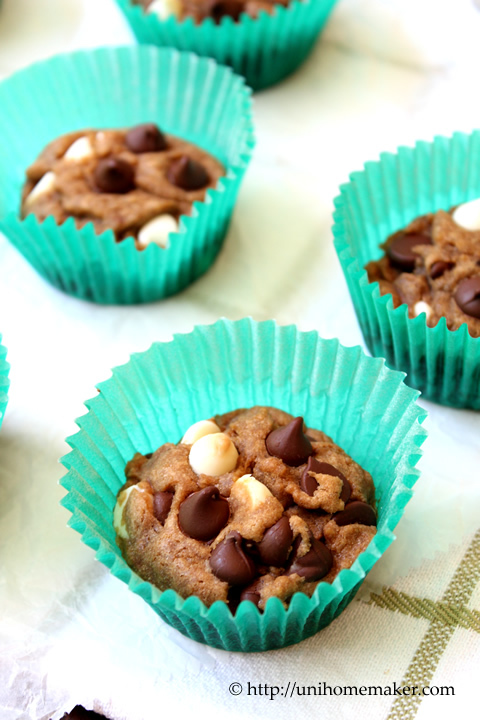 I love blondies, especially stuffed with double chocolate chips! Yum-yum! These are so good underbaked! 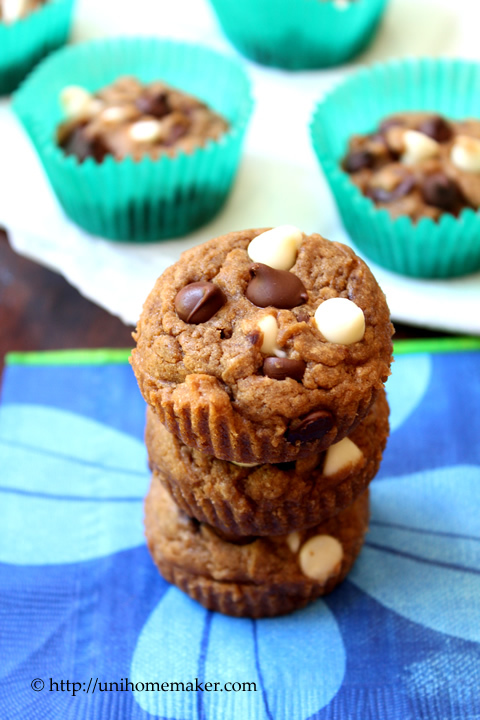 Love blondies loaded with chocolate chips! So cute in little bite-sized portions! Gorgeous pictures as always! These look amazing. Is it bad I want 1 (or 2) at 9:20am? Hehe. Such cute little bites! My kids (and hubby!) would each see how many they could eat before I cut them off 🙂 Any treat with chocolate chips is a winner around here!!! You and I are alike Anne. We seem to clean only when visitors are coming! Great-looking blondies!